Recently I have been trying to install a DFS Replication Group on two brand new Windows 2008 R2 Enterprise boxes belonging to a pretty old Windows 2003 Active Directory Domain. Nothing specially tricky in this activity, apart the fact that the AD Schema must be extended before we define a new replication group. 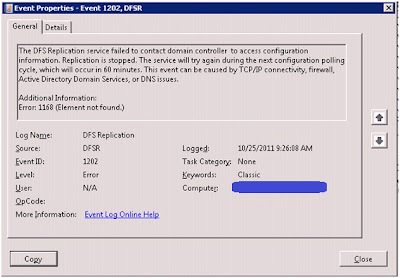 This is due to the fact that DFS-R stores its configuration info in the domain partition. The aim of this blog post is to share my quick procedure to do it, in case somebody should face the same situation, as I am sure there are still many Windows 2003 Domains around. First thing is "Don't panic". The Schema extension is pretty straightforward and it doesn't need you to reboot any of your precious DCs. You can do it without actually upgrading the Operating System on your DCs. 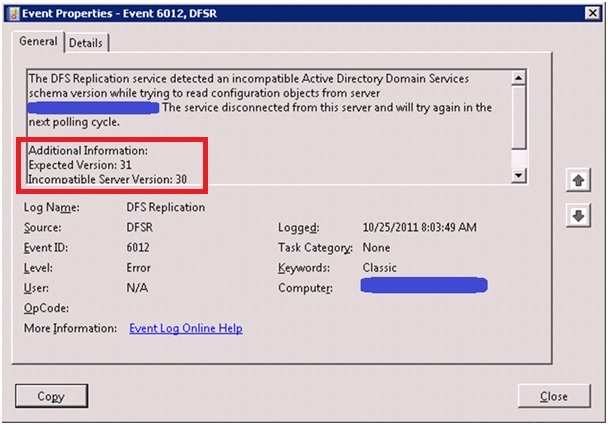 "domain.com: The Active Directory schema on domain controller DC1.domain.com cannot be read. This error might be caused by a schema that has not been extended, or was extended improperly. See Help and Support Center for information about extending the Active Directory schema. A class schema object cannot be found." 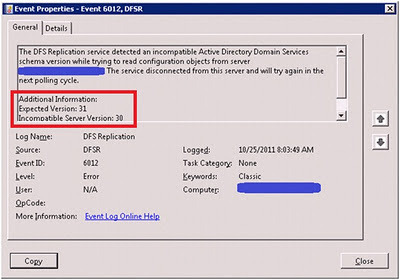 The DFS Replication service detected an incompatible Active Directory Domain Services schema version while trying to read configuration objects from server dc1.domain.com. The service disconnected from this server and will try again in the next polling cycle. 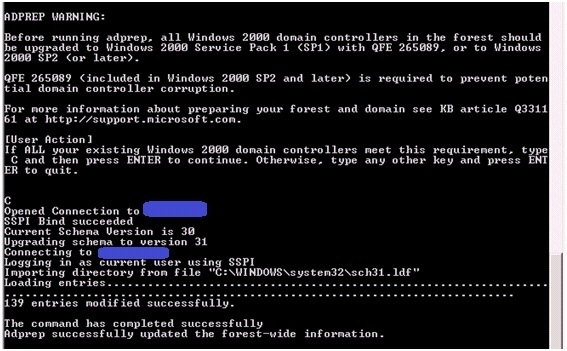 Now that you know which is the Schema Master and that you are sure that replication is performing properly, get on the Schema Master and run the "adprep.exe /forestprep" command from the Windows Server 2003 R2 installation disk 2. Press C to confirm that QFE 265089 has been applied and wait a few seconds for the command to finish. 1. When you change the Schema on the Schema master, the changes are automatically propagated to all other domain controllers in the forest. Therefore, it is not necessary to perform this operation on other domain controllers. 2. When you run adprep /forestprep to add the Windows Server 2003 R2 Schema updates, you do not have to upgrade your existing domain controllers to Windows Server 2003 R2; they can continue to run Windows NT® Server 4.0, Windows® 2000 Server, or Windows Server 2003. If you have done everything alright, the objectVersion should be 31 for a Schema updated to Windows 2003 R2. 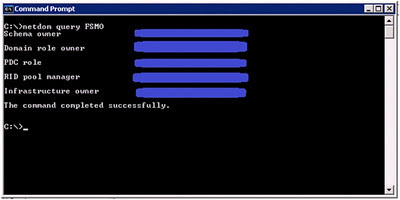 \\dc1.domain.com to access configuration information. 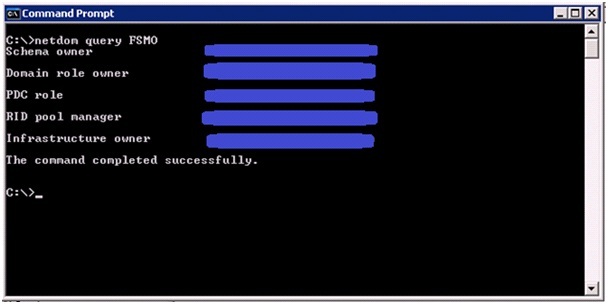 At this point, if you want, you can also upgrade the OS of you Domain Controllers to R2. It's very easy. On the same CD2, just run R2AUTO.EXE and follow the instructions. It will take three clicks and five minutes and no reboot will be required.